My edition: Hardcover, published in 2011 by Simon & Schuster, 452 pages. Description: Mara Dyer doesn't think life can get any stranger than waking up in a hospital with no memory of how she got there. First off: How gorgeous is this cover? I know one shouldn't judge a book by its cover, but I admit I am shallow that way and this one was definitely a main incentive in wanting to read the novel. 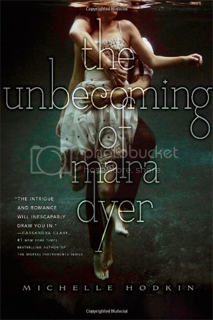 As for the story itself, I read it in a very short span of time (despite the fair few pages present) because I was intrigued by the plot and trying to figure out the real reason behind all the misfortune (understatement of the century) following around "Mara Dyer". And if a book can get me hooked like that, it's a good one in my eyes. I do have to say that towards the end I was a bit disappointed to find that this was yet another paranormal romance series and not a one-off novel about the premise on the back cover stating it'd be about a girl waking up after a mysterious accident that killed her friends but surprisingly left her unharmed. Still, for a paranormal romance the execution was done extremely well and the paranormal aspect was very much a background theme until much further into the story, leaving plenty of time to keep the reader second-guessing what's real, what isn't, and what's really going on with Mara. I was slightly torn between 3 and 4 stars, but I'll give it 4 in the hopes that the next installment in the series will be at least equally as good as this one.